Welcome to Thank Bergkamp It’s Friday – where members of the Gunners Town writing team gather to take a look at the Arsenal week that’s just passed. It’s a simple format, really – each week, a smattering of our eclectic scribes will select a HERO, a VILLAIN, a HIGHLIGHT, and a LOWLIGHT from the previous seven days. Lastly they will share what is in their ‘HEADLIGHTs‘, which could be a player to watch, a worry for a forthcoming match, a potential banana-skin to look out for…. A shout out to a person/organization that you feel has done something praiseworthy in the past week. Daniel: Santi Cazorla. He has been immense this season. What Arsene Wenger did was another masterstroke there. Playing Santi in central midfield gives him the ability to dictate play and join in on attacks. Every player at the club talks about Santi and about how amazing it is to play alongside him. A lesson to all future footballers, no matter how tall or short you are, hard work always pays off. Matt Cotton: Jack Wilshere. For not picking up an injury despite playing a good 25 minutes of football on Monday night. Awolowo: Arsene. For keeping faith with the same XI for the 1st time in his Arsenal career. Has to count for something. Omar: David de Gea. Hate to highlight a United player as a hero but let’s face it, he once again kept the opposition at bay with a string of how-did-that-not-go-in saves and spared his team’s blushes. For some reason, Manchester United are still in the race for Top 3! A shout-down to a person/organization that you feel has done something shameworthy in the past week. Daniel: Our Goalkeeping staff. We’ve been having slight errors, injury problems and a host of other problems with our goalkeepers since Jens Lehmann left the club. I like both David Ospina and Wojciech but our goalkeeping staff need to solve these issues. 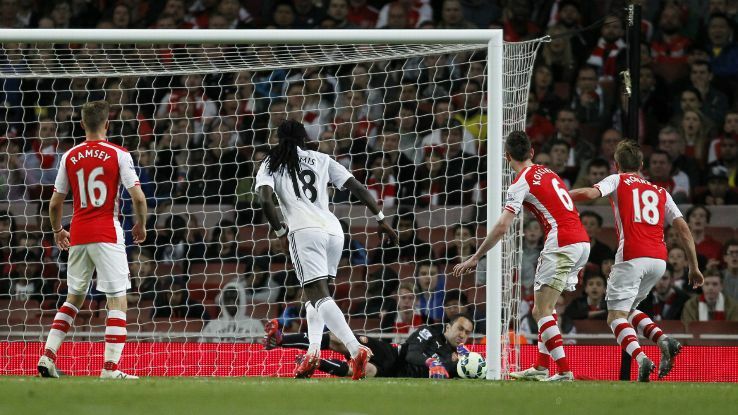 That Swansea goal wouldn’t have counted had Ospina been a little bit more aware of the situation. Andrea: I don’t like naming names but Theo Walcott has been quite disappointing against Swansea. I’m not worried by the chances he didn’t convert, what really bothered me was his apparent lack of involvement; in such a tight game he didn’t show the desire and hunger that his teammates were transmitting. It sounds like he doesn’t really want to grab a starting spot in the team – or maybe he already decided to leave. Awolowo: Santi Cazorla. Not allowed to score from open play, which finally cost us on Monday. Omar: Cristiano Ronaldo. Criticism has been leveled at Bale for his spurned opportunities but considering you have, apparently, one of the world’s best players in your side, you’d expect him to turn up in the semi-final of the Champions League! Ronaldo’s shortcomings were plain in sight Wednesday night and for a star man, it was not a star showing when it was most required. The most memorable or poignant moment of the past week. Typically an event, rather than a person/organization. Andrea: Well, again – it’s hard to find a highlight for this week. We were missing that final, scintillating piece of skill that would have won us the game and none has been able to produce it. My highlight of the week has happened elsewhere and is Robert Lewandowski’s goal against Barcelona: a combination of flair, technique and merciless finishing. Go and get him, Arsène!!! Matt Cotton: I guess it’s nice to know that the goal technology works. It’s just a shame it had to happen against us. Awolowo: The confidence brewing within the team and fans alike before the Swansea upset was refreshing. Omar: Juventus. It has to be doesn’t it? Historically one of Europe’s giants, after many years not only progressed through the knock out stages but actually made the final. No one would have predicted it. It’s a glimmer of hope for the Serie A and from a history/tradition perspective, it’s certainly nice to see them back! The most forgettable or disappointing moment of the past week. Typically an event, rather than a person/organization. Daniel: Our defeat to Swansea City. So disappointed. We dictated the whole game, practically had 85% possession and couldn’t score a goal. With players like Cazorla, Ozil, Sanchez, Ramsey, Wilshere and Giroud we should have scored at least one goal in the second half. Not good enough if we wanted to win the league next year. Andrea: Gifting the second place so easily was my lowlight of the week. We had a very good chance to finish there and it was all in our hands, now we’re virtually sure to finish below Manchester City. Winning the remaining three games would put us on par with Pellegrini’s men but the goal difference is hugely against us – we should have done much better. Matt Cotton: Realising at 8.30pm on Monday that you knew exactly how your night was going to end up, and then still watching despite 10 goals going in on the other channel. Awolowo: The upset even critics didn’t see coming. Omar: Arsenal of course. Sure, as fans, we went into the game with a bit of caution because it’s Swansea but could we be blamed for being confident for a win? People say same old-same old but the positive was that we did create enough chances, but they were all hit at the keeper! Same-old was the manner in which we conceded the goal, and that was the LowLight for me. We just might have to settle for 4th again! Daniel: The game vs. Manchester United at Old Trafford is a huge one, win that and we guarantee a top three finish. Lose it and it could turn into a nightmare for Arsenal. I still believe we can clinch second place. It will be really sad if Arsenal don’t get anything out of Manchester. Anything but that Champions League qualifier! Andrea: Old Trafford on Sunday. We have a golden opportunity to prove our home defeat against Swansea was a slip, securing the third place in the meanwhile. We won there in the FA Cup so we have the mental ability to go there and grab the three points, it’s up to the lads to prove something. If we don’t get a good result, get ready for a tornado of “it’s the same old Arsenal!” stories. Matt Cotton: A draw would not be the end of the world at Old Trafford. A defeat would be horrid. Awolowo: A chance to bounce right back at OT. Probably the perfect game. Omar: Old Trafford. Though we beat them last time out, luck seems to be on their side. Nevertheless, it’s the one to look forward to and THE game that matters more than anything else. It’s going to be a close encounter and I hope we score the first goal. LvG is unlikely to park the bus, he didn’t do it last time, so that should give us a good opportunity! Think happy thoughts. We’ve done it before. Recently. So… What really happened against Swansea? !